There has been quite some noise about MacBooster, an app that I've used for a while. More precisely, I purchased MacBooster 3 in 2015 and used it ever since. I also tried MacBooster 4 — an upgraded version IObit released in 2016, and now the latest version is MacB﻿﻿ooster ﻿6 by the time this review was last updated. Please note: different versions are separate programs that can run on a Mac independently, and I'm yet to buy MacBooster 6 which would cost only $10 (a special offer, since I am already a MacBooster user). In this MacBooster review, I'm going to show you who would benefit from the app, including its pros and cons. I'll also share my personal takes on using the app, and answer some frequently asked questions about MacBooster. IObit M﻿acBooster isn't for everyone, and power users probably prefer to use macOS system utilities or other free apps to perform many of its functions. But if you're new to the Mac world or are a bit uncomfortable with diving into technical stuff, MacBooster is about as good as you are going to find when it comes to its all-in-one nature. Also, if you are like me who want to save some time keeping Mac system in shape, you'll benefit from the app as well. It will help you reclaim more disk space by removing gigabytes of unneeded files from your Mac. It contains a handful of useful tools to maintain good performance for your Mac. The app is incredibly easy to use with sleek and intuitive graphic user interface. It's a bit annoying to see the "Empty Trash" warning every time I drag something to the Trash. More explaining is needed for each removal and action before it’s executed to avoid human mistakes. Side note: this review has been updated for accuracy and freshness. The latest version is MacBooster 6 and the app fully supports macOS 10.13 High Sierra. Is MacBooster safe and legitimate? For those of you who are new to the software, MacBooster is a program developed by IObit for Apple Mac users to maintain macOS system. It is a multiple-in-one software suite that includes a collection of smaller utilities that aim to free up disk space and protect Mac safe. Provide real-time protection for your Mac by removing malware and virus. Clean system junk and unnecessary files to regain more free space. Boost your Mac system performance with a few speed-up utilities. Other useful tools to help you keep your Mac in good shape. I've used MacBooster for quite a few years and yes it's safe. The app does not contain any malicious features that harm your computer. And yes, it is legit — designed and developed by a company called IObit. I heard from the Internet that some people call it scam or crapware, that is simply not true. Those people are probably firm believers that Macs and macOS can take care of itself and does not need any maintenance, thus any third-party software that claims to optimize a Mac has often ended up with skepticism. I am an advocate of Apple too, and I did bear the same perception that Macs are safe. Things have changed these days, and it's no secret that Macs are less safer than before. Read this NYTimes article and this geek news. Or just do a quick Google search related to Mac security issues in recent years, you'll understand what I mean. However, I have to warn you though that if you download MacBooster from unauthorized third-party download sites other than its official website, there could be some issues because of the unethical software bundle behaviors that may endanger your Mac system. But, it has nothing to do with MacBooster. So, as a Mac user, you should always have the habit of getting apps from App Store or their official websites. According to the IObit release note, version 4 differs from version 3 in several aspects. First off, the newer version has a new user interface (as seen below). Personally, I feel the features in version 4 are more organized and intuitive. Secondly, the new version enhanced its real-time protection and system clean capabilities. In addition, two new features Privacy Clean and Extensions Manager are added. New update: the latest MacBooster 5 differs from version 4 in that ​version 5 has enhanced its security and cleaning capabilities to a greater level. Here's a screenshot of MacBooster 3. Here's the main screen of MacBooster 4. ​And here comes MacBooster 5. Note: the original review and screenshots below were based on MacBooster 4 (while the latest version is 6). That said, the conclusion about the app still stands. MacBooster combines quite a few different functions into a single app — hoping to add value with the so-called "all-in-one" concept, this is not rare in the software industry. All features fall into these four sections: System Risks, Cleaner, Booster, and Tools. Here's a quick rundown of each section. Malware Scan: scans and removes all kinds of viruses and threats to protect your Mac from malicious attack. You can also upload suspicious files and send to the IObit team for further analysis. Realtime Protection: detects malicious files, websites, DNS, etc. with various Shields (e.g. File System Shield, Web Shield, Mail Shield, etc. ), and removes them instantly to keep your Mac safe. Privacy Clean: securely cleans privacy files (cookies, saved passwords, browsing history, downloads, App traces, etc.) stored on Safari and Chrome to protect your online browsing. It's nice to have a dashboard that shows me overall security risk on my Mac. By the time I write this review, I ran a scan and here's the result: Malware Scan returned 76 issues, Realtime Protection 8 issues, and Privacy Clean 18253 issues. While I do like MacBooster's Malware Scan and Realtime Protection as they help keep my Mac safe, I'm not impressed with the privacy issues it found — most of the issues are browsing histories and cookies in Safari and Chrome, which I'd prefer to keep on Mac for a smooth browsing experience. System Junk: helps you take care of those unneeded files generated by the macOS system and third-party applications. A quick Scan gives you a visual view on how much space is occupied by different files, and you can click Clean button to remove them. Uninstaller: displays all programs you've installed on your Mac and allows you to remove those you don't need. You can then uninstall multiple apps at once without taking the time to do so one by one. Large Files Cleaner: helps you locate, view, and remove files, folders and applications that tend to take a lot of disk space. You can sort them based on file size, name, kind, or last used date. This is the part that I especially appreciate MacBooster. It finds 9.1 GB system junk that can be safely removed, and I can review the details and unselect files I'd like to keep. The Uninstaller feature gives me the capability to batch remove unused apps and their associated files (normally I have to uninstall them one by one). What impressed me most is the large files it finds: 70.4 GB! At first, I thought it's unbelievable. However, a careful review reminds me of those old movies I've watched but yet to clean. Thanks MacBooster, you saved me so much space. Extensions Manager: displays all kind of third-party extensions installed on your Mac including Safari/Chrome add-ons, web plugins, preference panes, dictionaries, and Spotlight plugins. You then remove them based on your needs. Performance Booster: cleans your Mac thoroughly for maximum performance. The module includes three sub-features: Application optimization, RAM optimization, and Disk permission fix. Startup Optimization: lists all Login Items that automatically launch when you Mac boots up. You can choose to disable those you don't need to speed up startup process. It also allows you to add favorite apps to the startup list. This is the module that you may or may not find that useful, depending on your Mac situation. If you have a relatively new Mac that doesn't have many apps installed, then MacBooster isn't going to help you regain much performance. Also, be careful when you remove extensions as some of them might be what you want to keep. The Startup Optimization feature is redundant to me as I can totally go to Settings > User & Groups > Login Items to optimize auto-startup items. Duplicates Finder: locates and removes duplicated files stored on your Mac. The Smart Check and Smart Clean feature save you time identifying the number of copies that can be deleted. File Eraser: permanently deletes files in a drag and drop and make them unrecoverable, even beyond recovery with professional﻿ ﻿data recovery software. This helps keep your personal privacy and business confidential. 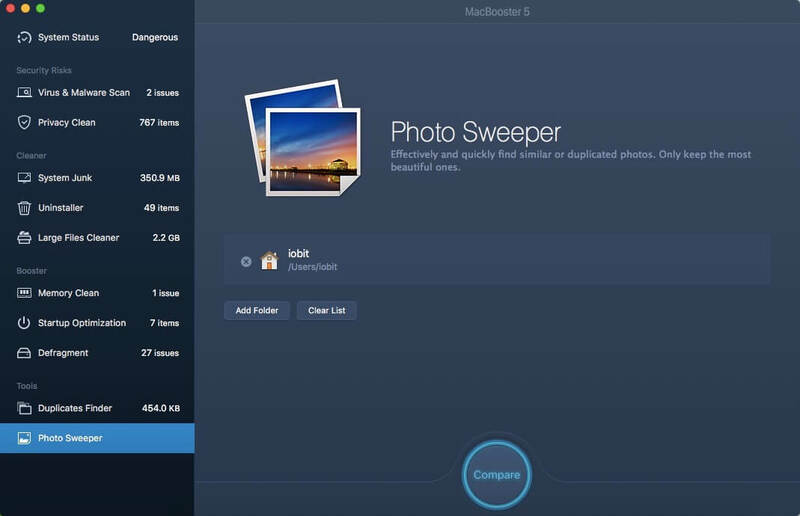 Photo Sweeper: finds similar or duplicated pictures that are safe for removal. In doing so, you could release a substantial amount of free disk space. You have the option to compare these photos before they are removed. The tools listed here could help you release more free disk space if you've used your Mac for a while, particularly the Photo Sweeper — a killer feature that locates tons of duplicated pictures I've synced from my iPhone (and iPad) to my MacBook, and it's great to see MacBooster organizes these photos in a nice way by showing a number of photos in different groups. As for the File Eraser feature, I'd recommend you use it with caution because once you shred some files, they become unrecoverable. It's clear that MacBooster works as advertised. The app does do what it claims to, and you can save gigabytes of space by removing unneeded files. The problem, however, is that almost every feature MacBooster offers can be found elsewhere — either from the built-in Mac utilities or third-party apps that are free of charge. For example, you can disable unneeded startup apps via macOS Settings > User Groups > Login Items, removing extensions are also relatively easy as you can open your Safari or Chrome web browsers and clean them based on instructions. Free utilities like Ony﻿x can help locate large files, and AppCleaner can uninstall apps and their associated remnants. That makes me conclude the value proposition of MacBooster is — convenience. Yes, you can spend a good amount of time downloading various apps and launching macOS system utilities to manually perform operations that MacBooster offers. But, think about the learning curve and possible confusion, versus a single click in MacBooster. Therefore, I'd say MacBooster is worth it unless you are a power user who doesn't mind digging into geeky stuff. Another factor we have to consider is the price. MacBooster offers one-time price starting with $39.95 for a single Mac. You'll want to make your buying decision based on the number of Mac machines you have and the convenience that MacBooster can bring to you. If you decide to purchase, don't forget to take advantage of this 25% OFF special discount below to save money. Follow this 3-step instruction to claim your 40% discount for MacBooster 6. Step 1: Click ﻿on this purchase link and hit the yellow buy button to enter the Shopping Cart page. See "Coupon Code" box at the bottom? Step 2: Copy this code FSMB40OFF and paste it in the box. Then hit Enter on your keyboard. Step 3: Now you'll see a new price that is 40% lower than the original one. For example, suppose you want to get MacBooster 6 Standard (3 Macs), the price is cut from $59.95 to $35.97. Done. Now you can take advantage of this offer and check out. No, MacBooster is not free or freeware. It does have a trial version that is free to download or use. But eventually, you'll have to purchase the software to activate its functions. In other words, you are allowed to scan your Mac for potential threats or system junk and MacBooster shows you the status of your Mac with a list of issues to be fixed. However, you need to input a valid license to get full access and unlock its functions. How to get MacBooster license key? You'll have to purchase the program to get a legit active license code. Be sure to leverage the above 40% off coupon if you decide to do so. Once you get a license key, click the yellow line "Input license here" on the bottom left and input the key to activate MacBooster. It's like the menu of MacBooster, with an italic B style icon that appears on Mac menu bar. Simply put, it offers a quick access to what's happening on your Mac and lets you clean junk files, free up memory, or empty Trash. Depending on your personal preference, you may or may not like it. For me, I dislike it because it's a bit disturbing to see MacBooster Mini shows up every time my Mac restarts. How to disable MacBooster mini? Fortunately, getting rid of MacBooster mini is easy. First of all, launch the app. On the Apple menu bar on the top left, go to MacBooster 4 > Preferences. In the new window, click the "MacBooster Mini" tab, and uncheck the option "Always keep MacBooster mini running". Now hit the "Disable" button. That's it. Now the mini bar disappears and won't show up next time. What if my Mac still runs slow after using MacBooster? There are many reasons why a Mac might run slower than it used to, and it's quite normal as technology ages, and eventually you'll have to get a new Mac (or PC). In general, all causes fall into two broad categories: software problems and hardware issues. While MacBooster could take care of the software problems on your Mac, it can't help on the later. Therefore, you would probably have to check your Mac hardware configuration. For further information, watch this CNET video for actionable tips on how to speed up a Mac. On the software menu, check Help > Uninstall MacBooster. Click "Yes" on the new window, and the app will be removed from your Mac immediately. IObit MacBooster is in a tough, competitive field against many other separate and all-in-one Mac maintenance tools. Like I said, almost every sub-feature in MacBooster can be performed either with macOS' default utilities or via free third-party apps. The core value of MacBooster all comes down to convenience. In other words, you pay for $40 in exchange for the time saved from manually doing tasks by yourself. So, back to the questions. Is MacBooster safe? Yes, it is. Is the app worth it or should you buy? Well, it depends. If you are a computer person, you probably don't need MacBooster. For those of you who are new to Mac or are not comfortable diving into the computer world, MacBooster is an excellent choice. I hope you find this MacBooster review helpful. As always, if you have any questions regarding the app, your Mac, or tech in general, let us know. This is one of the most unbiased reviews I’ve ever read. Good job on putting them together. Lots of work, right? Keep up the great stuff. Thanks Ryan! Yes, it did take a lot of time and effort to put together. Glad you find it useful.